Could you scratch my back? A little to the left please. Finally this painting started letting me know what it needs. I was the one doing all the talking this past week. Tonight it talked back. This is a good thing, for the most part. It’s still yammering but I had to come blog to you. What I know now is that this painting is way too immature to be finished by Monday. When an artist works intensely on a painting for a period of time, it becomes hard to make judgement calls. The same thing is true in all aspects of life; your brain normalizes things. It’s a fact. The first time you eat crazy spicy food you’ll put a dent in the ceiling but after a while it will seem fairly normal to you. If you are staring at a painting for hours or days or weeks or in my case sometimes months it becomes hard to see it objectively. Those 3 eyes on that face seem just about right. There are tricks to seeing a painting with fresh eyes. One thing I do is look at it in a mirror. The faults usually jump out and give you a stomach punch BAM! Another trick is to take a photo of it and post it on your blog. Wow, that’s what I did tonight? But the best thing is just not to look at it for a long time. Ideally when I finish a painting I like to take some time off from it and give it another look before it heads off to a gallery or a buyer. There may be some changes I need to make. Hopefully not any major ones. I’m just bringing this up because if I did manage to finish this painting by Monday I wouldn’t have that luxury of getting to see it with fresh eyes before it goes out into the world. You have a mature process for finishing a painting, and there is no reason to change it. That’s what I’m getting out of this. 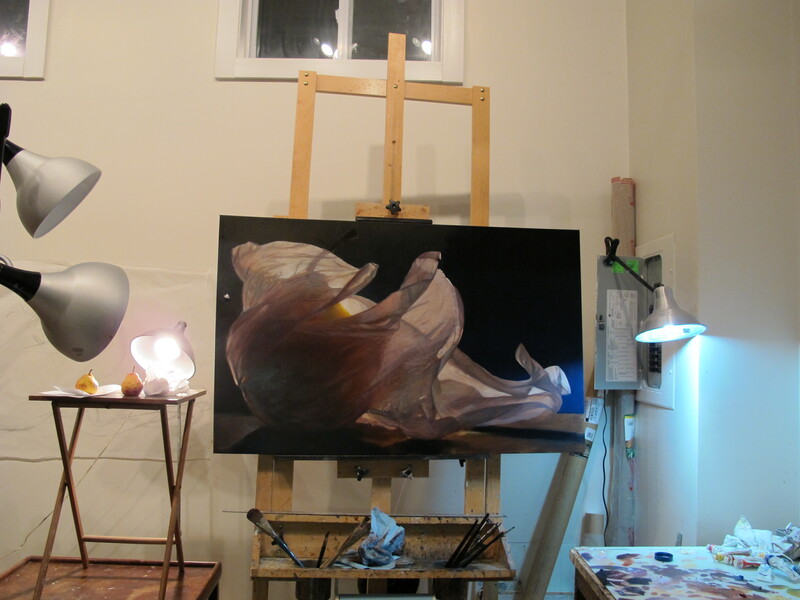 Pretty esoteric idea, deciding when a painting is ready. I’ve never been one to strive for completion, and I don’t have a sure sense of when something is “done.” Interesting. I’m a “good enough” person. Love following your process. And it’s funny that I thought your first underpainting looked done to me! Eye of the beholder and all that.